The reviews for Sam Mendes' Revolutionary Road are beginning to trickle in, and so far they have been glowing. 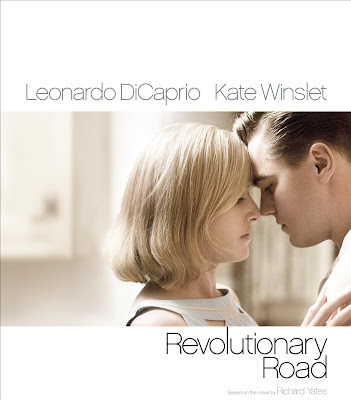 Revolutionary Road is a corrosive and heartbreaking masterwork. Sam Mendes' best film yet is exquisitely cut, blended and calibrated with superb music by Thomas Newman and legendary performances from Leonardo DiCaprio, Kate Winslet and Michael Shannon. It's the strongest heavyweight drama I've seen all year so far -- much more searing and moving than I expected. "Revolutionary Road" is a very good bigscreen adaptation of an outstanding American novel -- faithful, intelligent, admirably acted, superbly shot. It also offers a near-perfect case study of the ways in which film is incapable of capturing certain crucial literary qualities, in this case the very things that elevate the book from being a merely insightful study of a deteriorating marriage into a remarkable one. Sam Mendes' fourth feature reps what many people look for in the realm of serious, grown-up, thoughtful film fare and, led by the powerful performances of Leonardo DiCaprio and Kate Winslet, teaming for the first time since "Titanic," Paramount Vantage should be able to push this sad tale to a potent commercial career among discriminating audiences. And Sasha Stone over at Awards Daily is going ga-ga for it too. Wells claims that Revolutionary Road is now the Oscar frontrunner, but it still has the much loved Slumdog Millionaire to contend with, as well as (although to a diminished capacity) The Curious Case of Benjamin Button. At last this year's race is getting interesting.